A prickly place to build a nest! 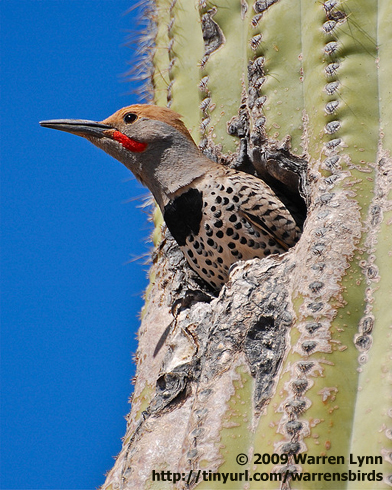 In the arid Arizona desert, where cacti thrive but trees are scarce, the Gila Woodpecker and this Gilded Flicker carve out nest cavities in living saguaros. Tall, old saguaros may be pocked with twenty or more nest holes, bearing witness to decades of woodpecker families. The woodpeckers excavate a new nest every year, leaving the old, now-empty cavities behind. But they don't stay empty for long. Elf Owls, Ferruginous Pygmy-Owls, Purple Martins, and Brown-crested Flycatchers all find the slightly used woodpecker cavities superb nest sites. A large, tawny woodpecker undulates in flight, flashing golden underwings as it lands atop a tall cactus. [Gilded Flicker call] The bird is a Gilded Flicker. And the cactus is a saguaro, the tall cactus with upswept arms emblematic of the Arizona desert. In this arid landscape where cacti thrive but trees are scarce, woodpeckers rely on the saguaro for nesting. The Gilded Flicker and the Gila Woodpecker, [Gila Woodpecker calls] species adapted to desert life, carve out nest cavities in living saguaros. Tall, old saguaros may be pocked with twenty or more nest holes, bearing witness to decades of woodpecker families. [Saguaros benefit wildlife in other ways too, providing nectar and fruit for birds, bats, and insects.] These majestic cacti are now protected by law in much of the Southwest, so that desert habitats and wildlife will not be deprived of an essential and iconic natural resource. Bird sounds provided by The Macaulay Library of Natural Sounds at the Cornell Lab of Ornithology, Ithaca, New York. Glided Flicker 109052 recorded by G.A. Keller; Gila Woodpecker 45164 by G.A.Keller. ; Elf Owl 40636 by G.A. Keller; Ferruginous Pygmy-Owl 105563 by G.A. Keller; Purple Martins by C.A. Sutherland; Brown-crested Flycatcher 105560 by G.A. Keller.